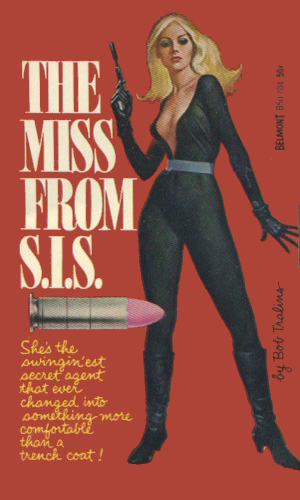 Series Name: The Miss From S.I.S. Lee Crosley is an agent for S.I.S. Disgusted with the way that the male of the species had messed up the world, a group of women comprised of doctors, lawyers, scientists, and many others decided to create an organization dedicated to helping put things right. They created the Society of International Security to be their private clandestine operations agency. Heading up this covert organization out of her houseboat in Miami Beach, through which could be reached via hidden passage the world headquarters for S.I.S., is Maggie O'Malley, codenamed MOM. The front for her operation is a world-wide travel agency which includes a magazine monthly showing all the latest vacation spots. Sending agents as photographers and models not only gives the group entry to places they might not normally get but also provides terrific cover as most guards are male and therefore likely to be admiring the gorgeous models, not suspecting them of spies. Acting as an ace reporter, thus giving her reasons for hitting hotspots around the globe, is Lee Crosley. This young, beautiful woman was married to an agent for the U.I.A. when he went missing in action. Wanting to search for him, she turned to MOM and became an agent of S.I.S. After time, she has become their key agent. 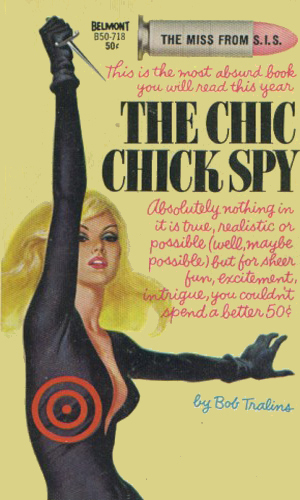 Unlike other rather frivolous series with females as the lead, such as the Lady from L.U.S.T. and the Girl from H.A.R.D., the Miss from S.I.S. is not an oversexed nymphomaniac spending more time in bed than in battle. Quite the reverse as she is accurately described as 'wild, pure, swinging, pristine'. She isn't out for whoopee. Everyone else is. 1 The Miss From S.I.S. The President of the United States has plans to make himself king and turn the country into a dictatorial monarchy unless Lee Crosley can talk him out of it. The woman calling herself Queen Sheba has a potion that make men effeminate and females aggressive, changing things around a bit. She is planning to unleash it to the world if Lee Crosley doesn't stop her. Reports of UFOs have increased, as have indications of an outbreak of something like the bubonic plague. Whether it is the work of a power hungry mad man or aliens from outer space is the question that Lee Crosley must answer. If she can get past the hungry crocodiles. I cannot say a lot bad about these lightweight tales, though there isn't much good to say, either. They have small amounts of titillating humor, minute doses of fairly good action, and that's about it. The best word might be harmless. Better yet, think of cotton candy. Sweet and enjoyable but not long lasting and after a while will rot your teeth. I can't say my teeth were rotted by reading this series but neither was I left with anything memorable. Well, except for Lee. She is adorable. But the rest of the books are not.